Recent regulatory recommendations (ICH-E14) have significantly impacted the way that studies are designed. For the purpose of a „thorough QT study“ thousands of ECGs have to be recorded in a short period of time. Modern technical equipment enables us to deal with huge volumes of ECG data. 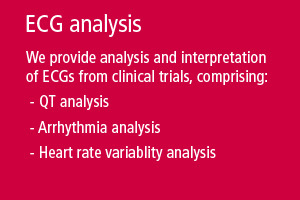 Our capacity to evaluate ECGs currently exceed 20.000 recordings per month. continuously looking for new ECG parameters that may help to assess the cardiac safety of new drugs.